Babylonian amora of the fourth century; a junior contemporary of Ulla. He was educated at his father's house in Pumbedita; and once when Ulla visited there the latter expressed displeasure at the fact that Yiẓḥaḳ was not yet married (Ḳid. 71b). 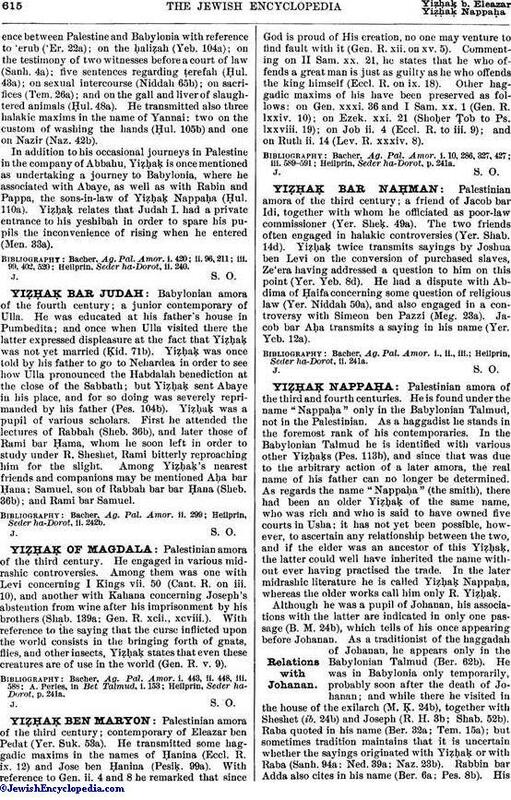 Yiẓḥaḳ was once told by his father to go to Nehardea in order to see how Ulla pronounced the Habdalah benediction at the close of the Sabbath; but Yiẓḥaḳ sent Abaye in his place, and for so doing was severely reprimanded by his father (Pes. 104b). Yiẓḥaḳ was a pupil of various scholars. First he attended the lectures of Rabbah (Sheb. 36b), and later those of Rami bar Ḥama, whom he soon left in order to study under R. Sheshet, Rami bitterly reproaching him for the slight. Among Yiẓḥaḳ's nearest friends and companions may be mentioned Aḥa bar Ḥana; Samuel, son of Rabbah bar bar Ḥana (Sheb. 36b); and Rami bar Samuel. Heilprin, Seder ha-Dorot, ii. 242b.